Theatre Memphis' 100th anniversary is on the horizon and big changes are afoot. But first, a somewhat smaller 2019-20 season. When TM hosts its grand re-opening in August, 2020, patrons will enjoy expanded restrooms and common areas, additional service areas, and more. And if the new season is somewhat abbreviated by the renovations, it's also crowd-pleasing. Mamma Mia! AND Cats back to back on the main stage with only A Few Good Men in between? That should fill seats and make people very thankful for the expanded bathroom facilities to come. Set on a Greek island and to the music of the international pop group ABBA, a young girl plans her wedding while trying to discover who of three men may be her father … all to the distress and ultimate joy of her mother. Based on the book Old Possum's Book of Practical Cats by T.S. Eliot, will follow in the season line up with striking choreography and memorable tunes by Andrew Lloyd Webber. In this most-loved musical the scene is set in a large rubbish area which, after dark, becomes alive with cats of all types, shapes and sizes gathering for the Jellicle Ball, during which one cat will be allotted an extra precious life. Cats is heralded as one of the longest running shows on Broadway and includes the remarkable tune, “Memory”. A special holiday offering in December for the 42nd consecutive year at Theatre Memphis. 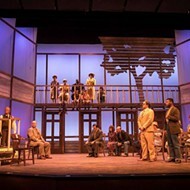 A sold out run during the 2018-19 season prompted the return of the classic which has been adapted and directed by Jason Spitzer. Though not part of the season membership, members will be afforded discounts on the adult full price ticket. An apathetic military lawyer is assigned to the case of two Marines charged with the murder of a fellow squadron member at the Guantanamo Bay Naval Base. An Internal Affairs legal ace thinks there is something amiss and pursues justice as the defendants refuse a plea bargain. The facts come out and lead to a court martial courtroom showdown that exposes the truth. Theatre Memphis Reminds Us, "It's a Sin to Kill a Mockingbird."